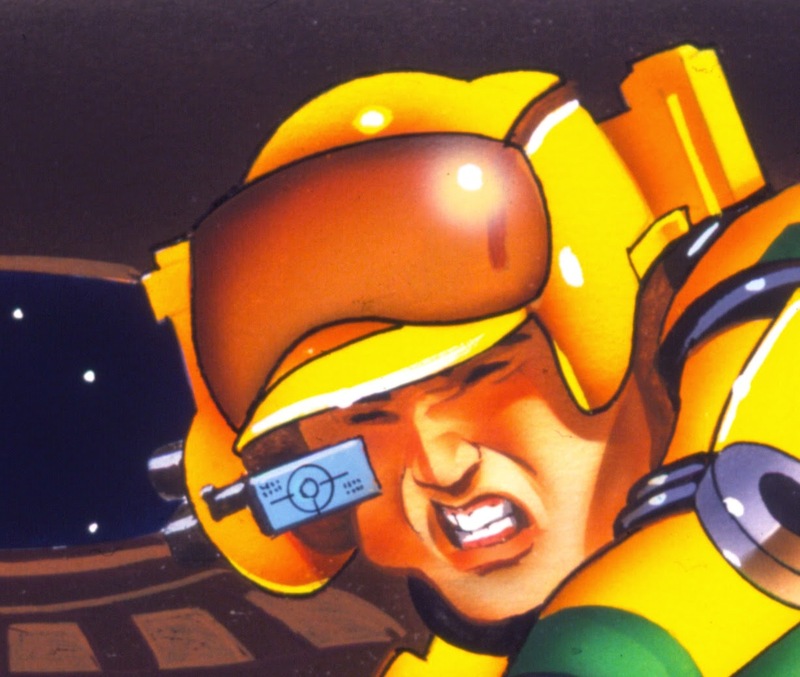 retrogameart.com: IT'S GOING…IT'S GOING...IT'S OUTTA HERE!!!! 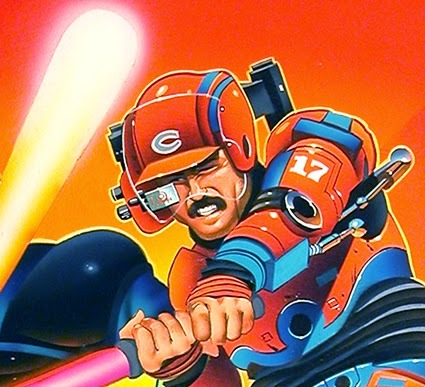 ...HITTING A HOME RUN, SUPER BASEBALL 2020 STYLE, in AIRBRUSH, BABY!!! IT'S GOING…IT'S GOING...IT'S OUTTA HERE!!!! 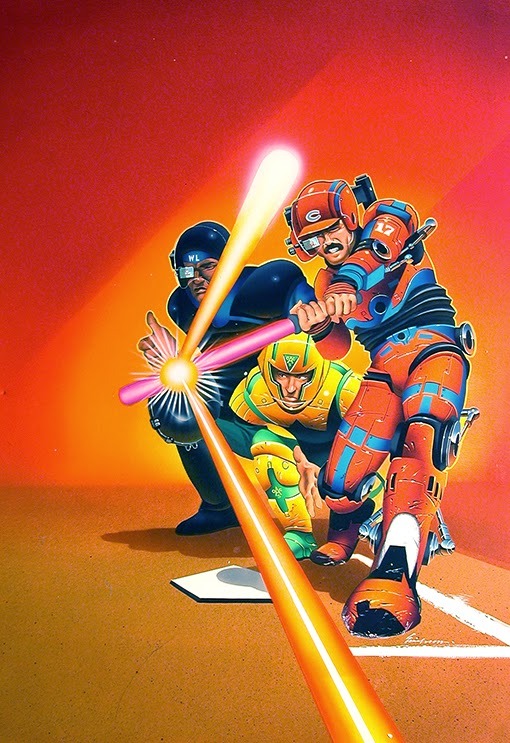 ...HITTING A HOME RUN, SUPER BASEBALL 2020 STYLE, in AIRBRUSH, BABY!!! 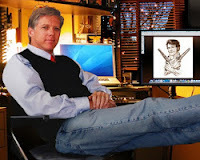 IT WAS 1990, AND IN ONLY 30 YEARS WE THOUGHT CYBER PLAYERS MIGHT FILL THE AIR WITH HOMERS! We're only six years out, and there aren't any cyberplayers in sight? Looks like another aerocar of the future, but WHO KNEW?! 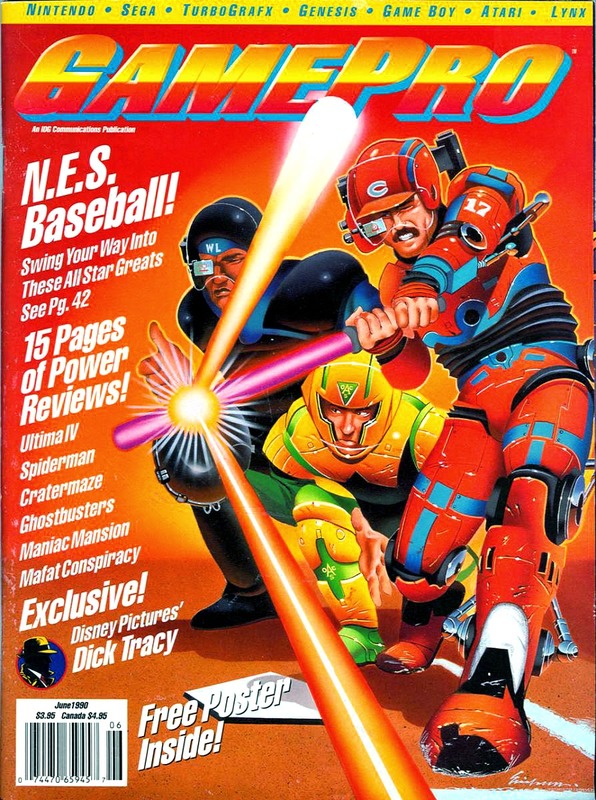 I got a call from Gamepro magazine for a cover based on the concept of cybernetic Baseball players in an NES game called Bases Loaded II: Second Season, from japan's Moero 3!! Pro Yakuu '88, and we took it to the wall! 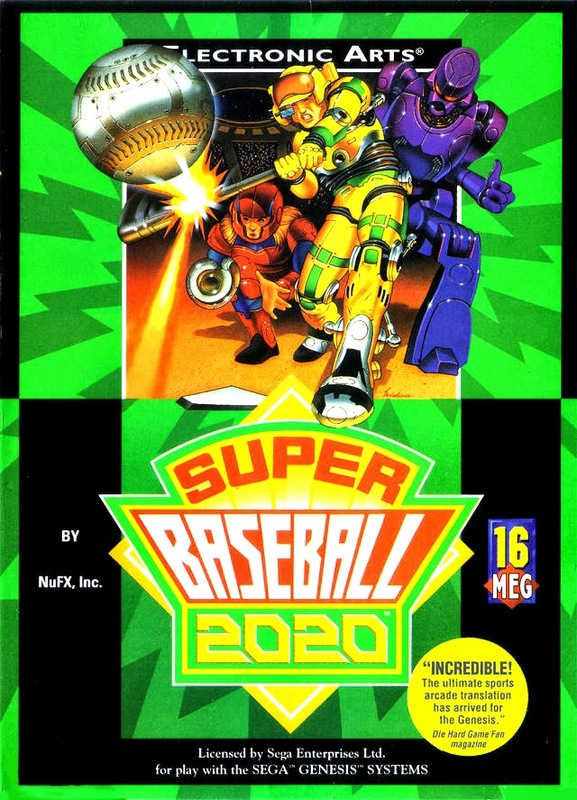 It was used on the cover, and as an inside illustration.This job, which eventually led to another piece for Electronic Arts in 1994 named SUPER BASEBALL 2020! The staff at EA remembered the cover and quickly gave me a call, and we got rolling. 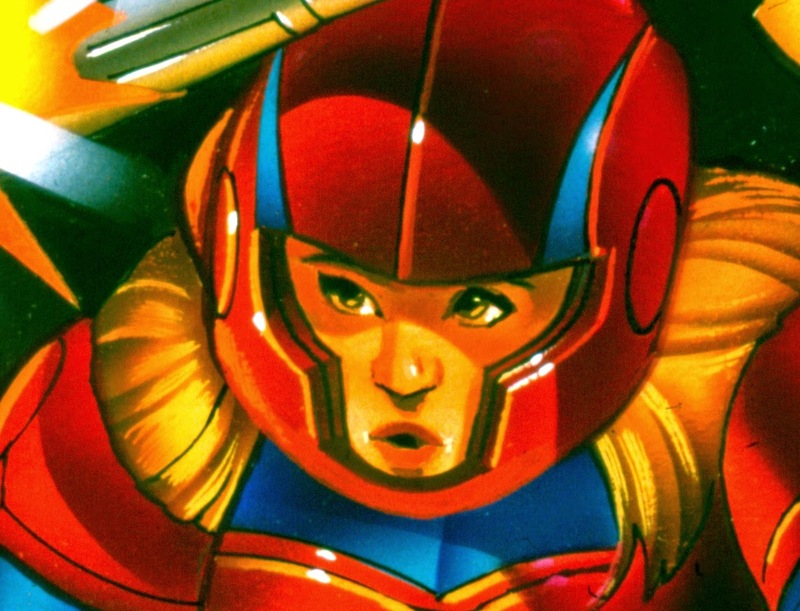 I've chosen these pieces to talk about using Airbrush to paint these illustrations because it seemed a good match: blasting paint and getting air! Fans of this site will of course recognize my fellow illustrator and model Carl Buell using some of his moves from his Double A SemiPro days! Super Baseball 2020 found many fans in Europe as well as Japan, the home of the original Bases Loaded II: Second Season! Otherwise known as my Tools of Ignorance, (as they once called a catcher's protective gear) …The Jun-Air Compressor … My airbrush of choice was the Thayer & Chandler. 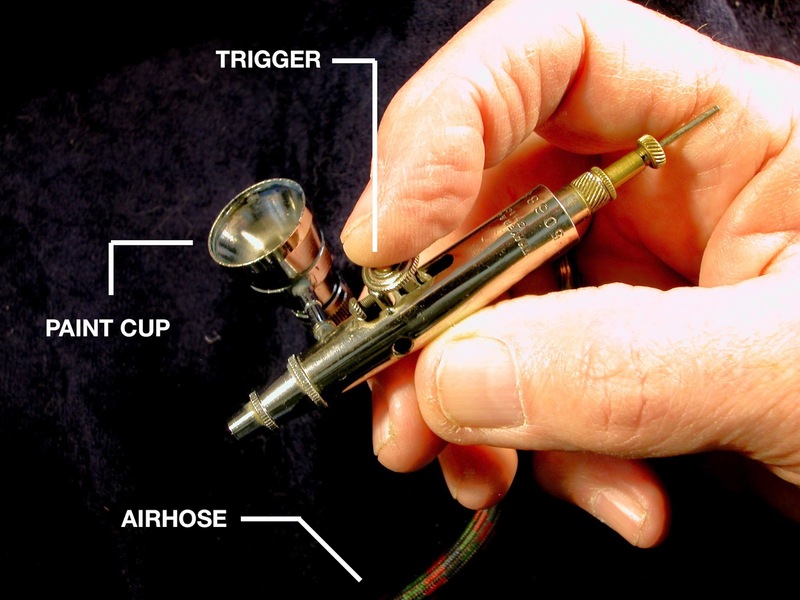 The rig I used for 95% of my video game art was my Thayer & Chandler Model A Air brush with either a tank of compressed air (early days), or a beautiful jewel-like compressor built in Denmark named the Jun-Air. 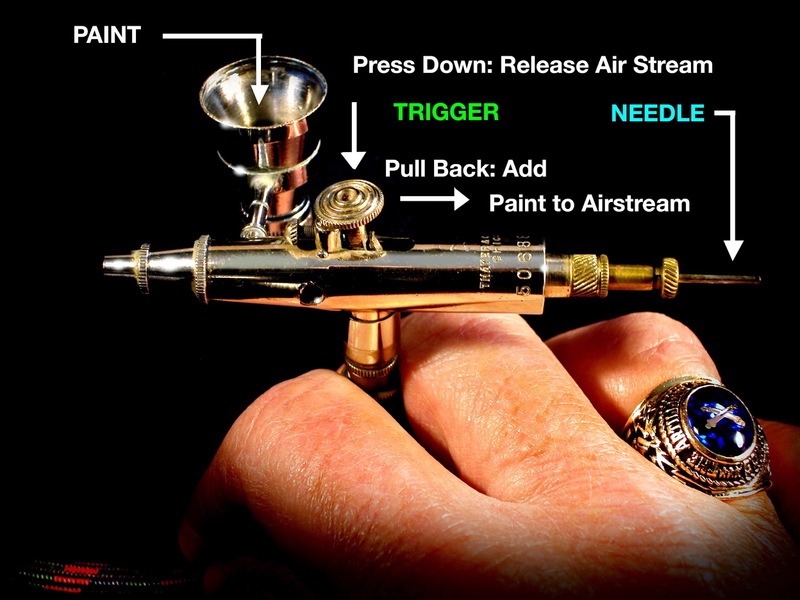 The airbrush was held as one would a pen, and had a top mounted pivoting trigger that released the pressurized air, pulling the paint from a side mounted cup into the pressurized airstream. This created a fine mist of color that laid down on the surface of the illustration board, and immediately dried. to constantly remove the pressure needle for cleaning. Portions of the art that needed to be protected from the paint overspray were covered with a tacky sided film called friskit. This was laid down over the art, and the areas to be painted were cut out gently with an Exacto knife, and the friskit removed. Here we see the 1994 U.S. release of the package for EA. Quite a handsome box with excellent design, as were most of EA's offerings over the years. I've always been grateful to Electronic Arts in joining Broderbund with their policy of allowing artists signatures to appear in the art. The smooth gradations and brilliant color were only two of the many reasons I employed the airbrush technique. I also found it to be very fast, which aided me in my scheduling of deadlines, and it seemed an extension of my drawing capacity. 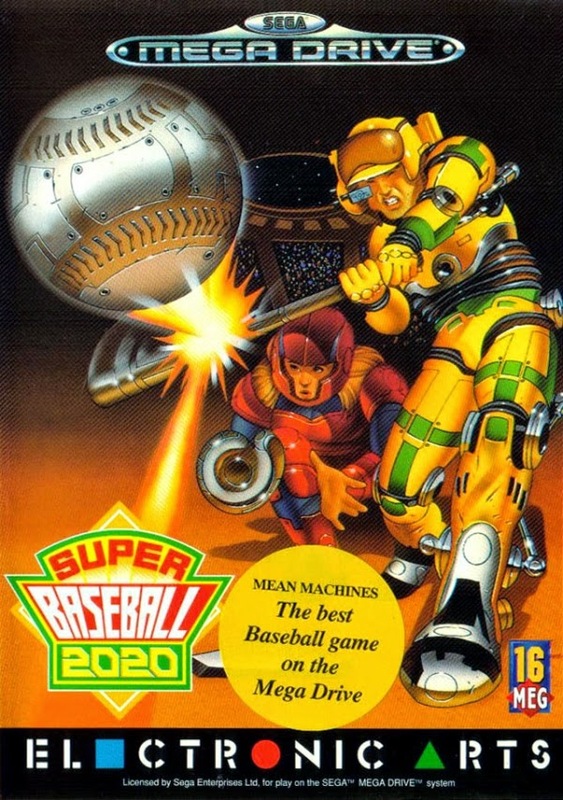 As you can see, the Game borrowed much from the Gamepro cover, but the baseball was added, and the catcher was made into a young woman, There was a robot Umpire added as well, but left out in this European release. It is also clear to see on the close up of the batter's and the young catcher's face the detail and clarity that could be gained by using the airbrush. 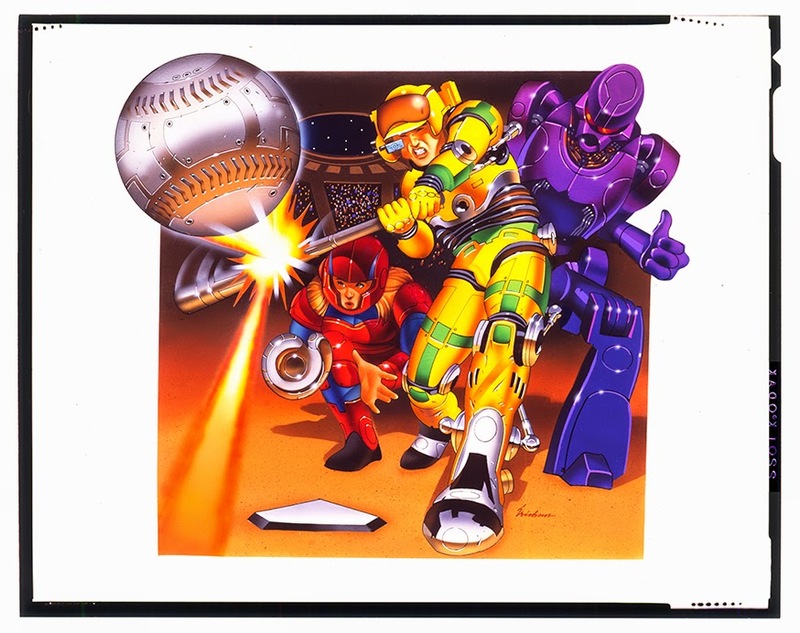 both the players and the Robot Umpire. THANKS FOR DROPPING BY!! I'll see you in Portland in October! 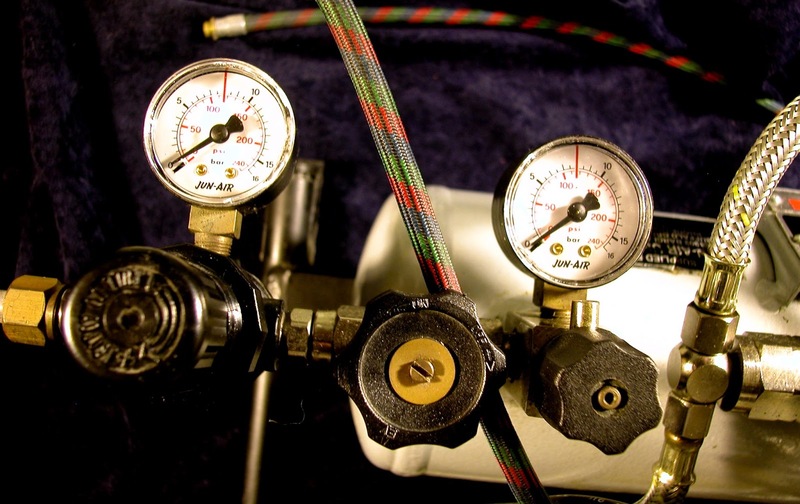 When it comes to selecting an air compressor it takes time and patience to find the right one to fit your application. 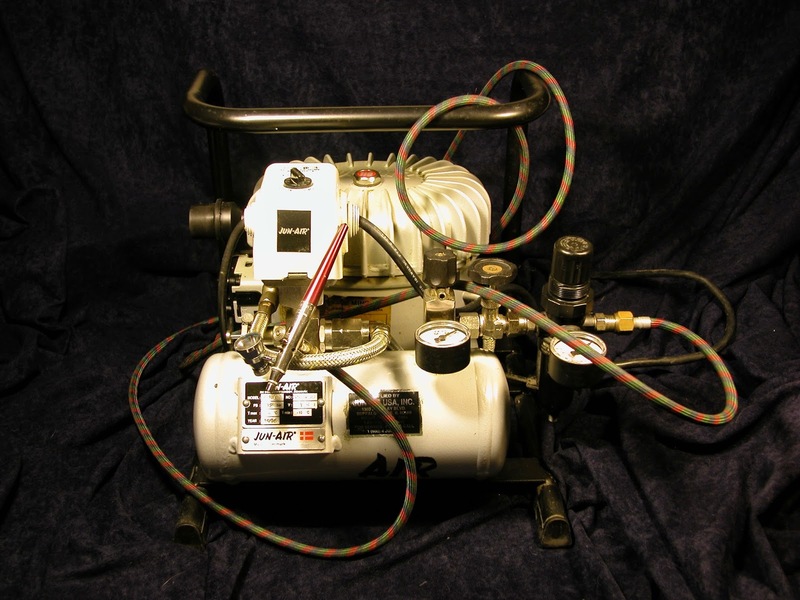 There are many factors to consider when purchasing an air compressor and the big two are quality and reliability. You can try the best quality air compressor for the money. I'm am lucky enough to find such a different post where I can learn some real things and valid too. As you have some sort of knowledge on these things, can you please help me to choose one for me from compressor reviews?